FFA - Barry University calls Project Veritas report about student ISIS club false, hurtful and criticizes their journalism. James O’Keefe issued a report via his organization called Project Veritas titled “O’Keefe exposes another university sympathetic to ISIS." The report states in part “Barry University Officials Unfazed by Club Purportedly Being Formed to Send Aid to ISIS; Their Only Suggestion was a More Politically Correct Name “Because Technically our Country is at War with ISIS.” Numerous organizations that oppose Islamization of America posted O'Keefe's report online and included it in their email broadcasts. 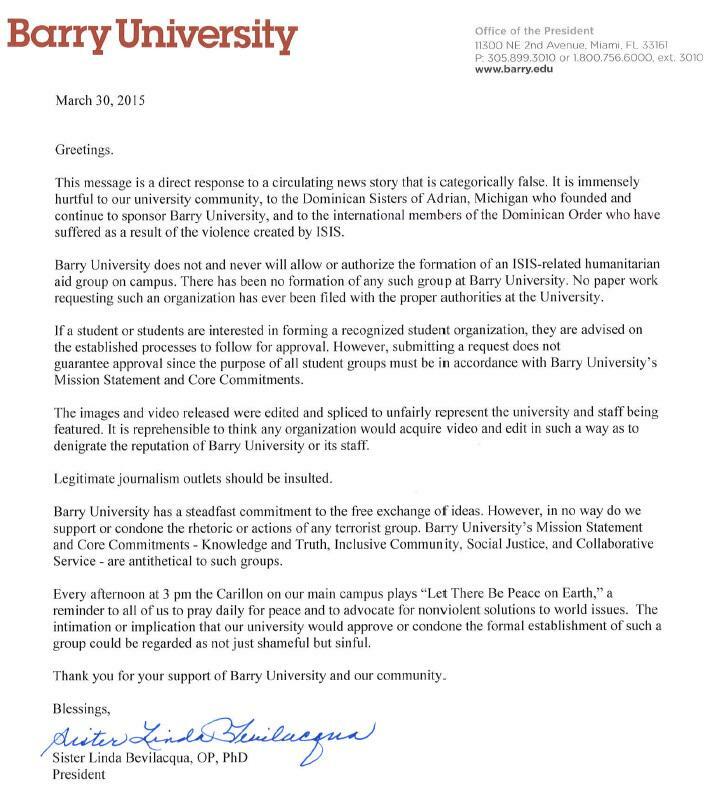 Florida Family Association promptly contacted Barry University president, Sister Linda Bevilacqua, and asked her to “please confirm that Barry University is okay with allowing students to have a club with the purpose of raising financial support for ISIS?” Click here to read email communications between Florida Family Association and Barry University president Sister Linda Bevilacqua. Barry University president, Sister Linda Bevilacqua replied within minutes. Her email stated “Absolutely and categorically false! Mr. Caton, I respectfully ask that you read my official statement and know the TRUTH about Barry University. Thank you.” The official statement is posted below. Florida Family Association, as a rule, performs due diligence on each issue before getting involved to determine the accuracy of the report and gather any important facts not present in the initial report. Given the seriousness of the alleged situation, Florida Family Association would have issued a call to action email alert urging people to contact Barry University about this report had the president not responded so promptly and definitively. The policies of most universities is to accept applications for student clubs, review them and either approve or deny them. Most universities do not reject a club without an application. Universities have been sued for denying club approval. Therefore, legal policies are in place to collect documentation for the process of approval or denial. Universities typically do not outright deny approval of clubs without accepting an application because it results in no documentation. 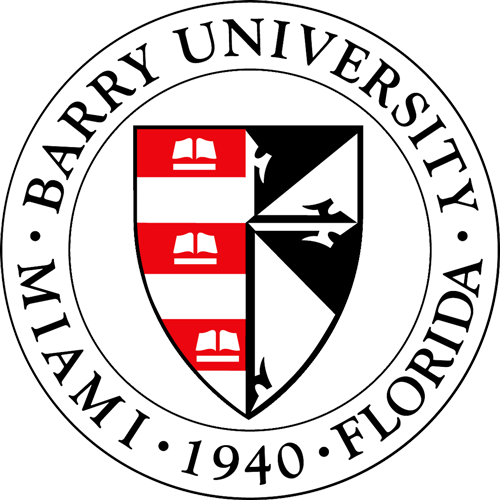 Omitting the president’s response from the report about Barry University presents a distorted picture of the situation. That report http://www.projectveritas.com/posts/news/o%E2%80%99keefe-exposes-another-university-sympathetic-isis has still not been amended. Why is this the case? If Florida Family Association had posted this report we would have been quick to report the good news from the president. "If our side is unwilling to acknowledge that an organization has clarified their position on an issue important to our mission then there is no virtue for such organizations to respond to our concerns." Notes David Caton, Florida Family Association president. "Florida Family Association does not hold over the heads of PAST Al Jazeera America advertisers that they once advertised on Jihad TV. To do so would be counterproductive. We always report when a company or government organization has responded with change that accommodates our requests."